I normally keep this blog to internal matters in the History of Art department – to the activities of, and news stories about staff and students. However, I want to take this opportunity to comment on the sad news, which broke on 12th October, that the final A-level in History of Art, being run by AQA, is being cut. What made this particularly depressing news is that a lot of work had taken place to renovate the curriculum of this A-level, to be launched next year. With input from leading figures in the field, A-level students were going to be offered a more global reach in their studies, and to explore how pressing social and political issues have been, and are always being played out through visual and material culture. The hope was that this could be the basis of a campaign to encourage more schools to offer the subject – and, crucially, a greater number of state schools. However, reportedly for solely practical reasons, AQA have made the decision instead to axe the A-level. This follows the sad loss of the teaching of other subjects at this level, including Archaeology. The story has generated much press, some of it promoting a number of frustrating stereotypes about History of Art which have become too familiar over the last few years: primarily the idea is that this is an elitist, and ‘soft’ subject. This was precisely the kind of misunderstanding, and unfair profile which the new curriculum was supposed to tackle, and I feel confident that I am writing here for an audience much better informed than that. As a student currently on one of our programmes in the History of Art department here at Birkbeck, you’ll fully appreciate what a wide-ranging, exciting, topical, and challenging discipline History of Art actually is. Furthermore, we have always enjoyed welcoming a diverse range of students from all kinds of backgrounds onto all our courses. One silver lining of the news story has been that it has led to a number of very fine pieces in defence of the subject – I’d particularly recommend Griselda Pollock’s article on The Conversation. A number of us in the field signed a letter addressed to the Chief Executive of AQA, pointing out how critical this subject is in an age in which it is imperative that our understanding of visual culture is sophisticated and informed, and expressing concern for the potential impact of this decision on the studying of History of Art at University level, and the various professions for which it is so important – especially those based in museums, galleries and the heritage sector. You can read this via the BBC News website. But I particularly want to draw your attention here to a live petition to save the subject at A-level: https://you.38degrees.org.uk/petitions/save-art-history-as-an-a-level-subject. The number of signatories has reached an impressive 17,648 at the time of writing, but it needs to grow still further. I would encourage anyone reading this, who would like to support and defend the subject, to sign. “After two terms of my History of Art MA, I was offered the chance to do a work placement, and was fortunate to secure a position in Tate’s research department. I write this approaching the end of the second week of our Autumn term. I do hope that everyone is settling in well to the new academic year, whether that’s to a new programme of study, or returning and continuing with work on the Cert HE, one of our BA or MA programmes, or the MPhil/PhD in History of Art. It was very nice indeed to meet our new students at our induction evenings, and to be able to offer a warm welcome alongside my colleagues in the department. Lots of useful material was covered in those events – and I’d like to recap on a couple of key pieces of information here, as a reminder to continuing students, as well as those who’ve just joined us. One is that our Careers and Employability team offer a variety of important services for Birkbeck students. They run workshops on a wide range of useful topics, have a drop in service at Malet Street, and provide access to a careers portal which is accessible through your MyBirkbeck profile. 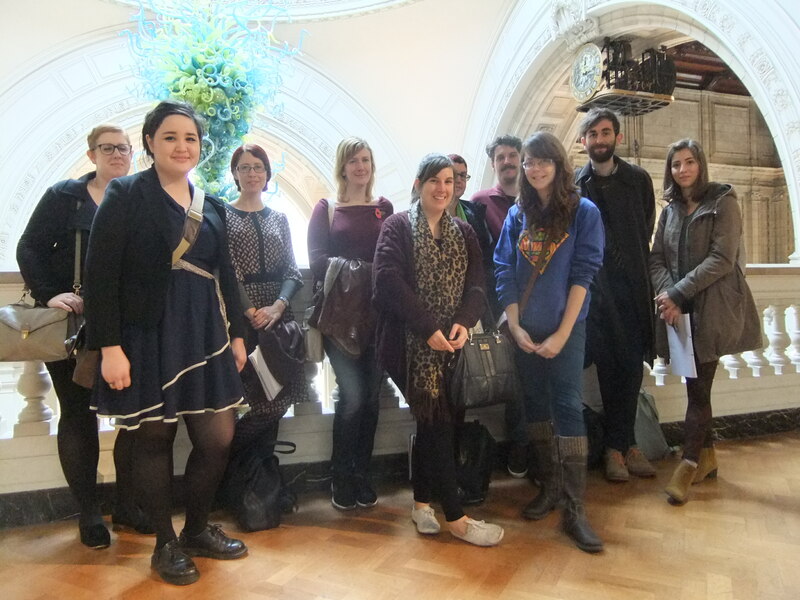 I’m also delighted to announce that we’ve just learned that we have been awarded some monies from the Birkbeck Alumni fund, to run a bespoke programme of events for History of Art students this academic year, 2016-17! We are busily planning, and hope to announce further details soon. Also, Sue Stern kindly joined us at a couple of the induction evenings, to talk about the work of and activities organised by the London Art History Society. Do have a look at their webpage for upcoming events. I would also strongly encourage all our MA and MPhil/PhD students to keep in mind the important Research Fund which the Society has so generously established in the History of Art department. This is to help with expenses relating to research, including travel, accommodation, photography, and photocopying. MA students can apply for a sum up to a maximum of £150; MPhil/PhD students for a sum up to a maximum of £300. Do have a look at this page for further details, and how to apply. One recent development we’re particularly excited about in History of Art is the appointment of T.J. Clark as a Visiting Professor in the Birkbeck Institute for the Humanities. I thoroughly recommend having a listen of the podcast of the Masterclass which Professor Clark gave at the BIH earlier this year, on ‘Heaven and Earth According to Bruegel’. Dr. Leslie Topp and Dr. Tag Gronberg have just headed off to Vienna, to speak at a symposium exploring Jewish contributions to Viennese Modernism. They will be contributing to a panel on ‘Designed Identities’ taking place tomorrow: Leslie speaking about modern architecture and anti-semitism in early twentieth-century Vienna; Tag giving a paper entitled ‘Myths of the Viennese Café: Ephemerality, Performativity and Loss’. There are plenty of upcoming events to watch out for closer to home as well. On Monday 24th October, at 6pm (room 106, Gordon Square), Tim Satterthwaite will be giving a paper for the History and Theory of Photography Research Centre, entitled Spiritualising the Machine: the Modernist Photography of UHU magazine. Meanwhile, I do recommend booking your free place for an exciting symposium being hosted by the Architecture, Space and Society Research Centre on Friday 18th November, entitled Spitalfields: On Development and Destruction (Keynes Library). This event will explore the possibilities of Spitalfields’ present and future, in relation to its rich and eventful past. Spitalfields is currently the focal point for a host of conflicting viewpoints on topics such as urban design, economic development, architectural preservation and cultural history, and this welcome symposium will bring together a diverse group of architects, archaeologists, historians and activists to consider the issues at stake. I want to devote the rest of this blog to the triumph of Open House weekend at the School of Arts building in Gordon Square last month. This was the third year the building opened to the public, thanks to the hard work of a number of colleagues including Leslie Topp and Clare Thomas. Over the two days, a grand total of 244 visitors were greeted and guided around the building by a wonderful team of student volunteers. I now hand you over to one of them, Michael Clegg, who has just completed the MA History of Art here at Birkbeck. “Like many a School of Arts student, my first experiences of the Gordon Square building were about being lost in winding corridors and identical staircases. Last year, however, I volunteered to help out at the London Open House Weekend and, not only did I learn my way around, but I enjoyed it so much that I was back for this year’s event, on the weekend of 17-18 September, once again excellently overseen by Eva Hoog. Our visitors get a tour of contrasts, opening with an introduction to Gordon Square’s Georgian architect, Thomas Cubbitt. It’s nice to point out how the building changes as you move through to the Victorian terrace at No. 47; a change which people often miss from the outside. Turning attention to the twenty-first century cinema built into the back of the terrace makes for a dramatic transition. Volunteers had been lucky enough to get an introduction to the space from one of its architects, Andy MacFee, and it was a pleasure to channel Andy’s expertise and enthusiasm. Then it’s off to No. 46 and its Bloomsbury heritage as home to Vanessa Bell, Virginia Woolf and, later, John Maynard Keynes.